The Sydney Morning Herald – SYDNEY, There was no hiding the despair in the eyes of Sydney FC players on Wednesday night having led three times against Chinese giants Shanghai SIPG only to fall short. But if there was a silver lining to their 3-3 draw, it was in finding the template they believe will deliver them a derby day triumph. 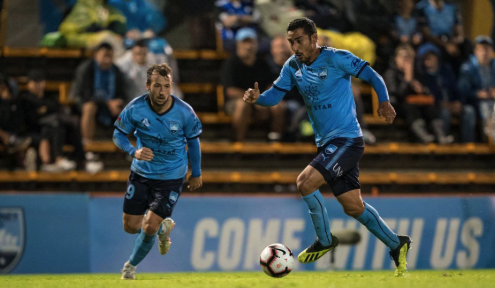 For parts of the match, Sydney FC outplayed a cashed-up team consisting of Brazilian stars Elkeson, Hulk and Oscar, the latter earning an income worth more than the entire salary cap of the A-League put together. They were punished for individual errors but were structurally disciplined. They were fluid and mobile in attack, found fortune when going towards goal more directly than usual and maintained a tempo well beyond their usual A-League rhythm. According to their players and coach, that is now the benchmark. They may only have two days between their Asian Champions League match and Saturday night’s derby but Sydney FC suggest if they can replicate Wednesday’s performance, they will continue their good run of form against the Wanderers. Sydney FC coach Steve Corica echoed the Iranian international’s sentiments. He wants his players to be sharper with individual errors after having a turnover punished by a late Elkeson goal on Wednesday but says his players must overcome fatigue to perform to that level against the Wanderers. Ghoochannejhad should have had a goal to his name on Wednesday only to be denied three times by Shanghai goalkeeper Yan Junling. After an otherwise solid display, Ghoochannejhad hinted he remains a strong chance to retain his starting position for Saturday night’s derby, his first in the A-League. “We played with a lot of courage and we played our hearts out and that was very positive. Saturday is a new A-League game and I can’t wait to start again,” he said.